Mifflin County’s Christian Fisher pulls Boyertown’s Chance Babb to the mat for back points in the 120-pound bout. Mifflin County’s Ethan Kauffman wrestles Boyertown’s Nicholas Montanye in the 132-pound bout at the PIAA wrestling team championships Friday in Hershey. Boyertown’s Connor Neiswender is pinned by Mifflin County’s Josh Snook in the 145-pound bout Saturday in Hershey. HERSHEY — Josh Snook hadn’t been on the mat this season for Mifflin County. In fact, the senior grappler has largely been a backup throughout his career. Friday, he staked a good claim on hero. Subbing for Trey Shoemaker at 145 pounds in the first consolation round of the PIAA Class 3A team wrestling championships, Snook shocked Boyertown’s Connor Neiswender, pinning the Bear early in the second period, the third of four wins by fall in five matches that led Mifflin County to its first dual meet win in state competition, 39-24. The fun ended in the morning. Mifflin County’s reward was a second-round matchup with Erie Cathedral Prep, which handed the District 6 champs a 42-24 loss to eliminate them from the tournament. The win over Boyertown was meaningful not just for the group of kids that came to Giant Center this year, but for the four teams that preceded them here — none of which was able to garner even a single victory, despite coming close against some of the state’s top programs. In the morning dual, Christian Fisher and Derek Burk both won decisions to give the Huskies a lead they would never relinquish. Fisher is the only member of the team to make this trip — and get on the mat — three times of the five the Huskies have come. He was pleased with the outcome, yet admitted this is not the best team he’s been here with. “I think my freshman year was probably the best team I’ve been on. I think the difference was the matchups we had,” he explained. “Freshman year we came down here and had Nazareth then Cumberland Valley” — both close duals. 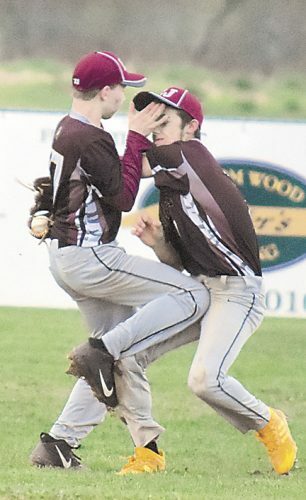 “I think the matchups against Boyertown (District 1) worked really well in our favor,” he said. 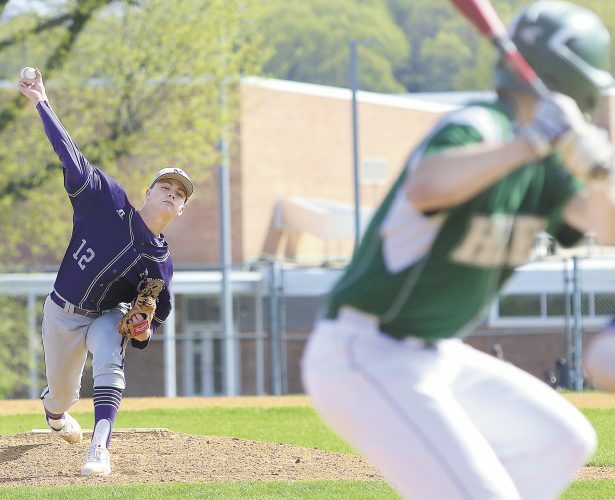 Mifflin County came alive through the middle of the lineup. Ethan Kauffman doubled the Huskies’ lead to 12-3 when he flattened Nick Montanye in the second period at 132. Kyler Everly, given the top to start the second period at 138, put Evan Detwiler on his back 39 seconds later for six more points. Both of those Bears were freshmen; neither had a winning record. 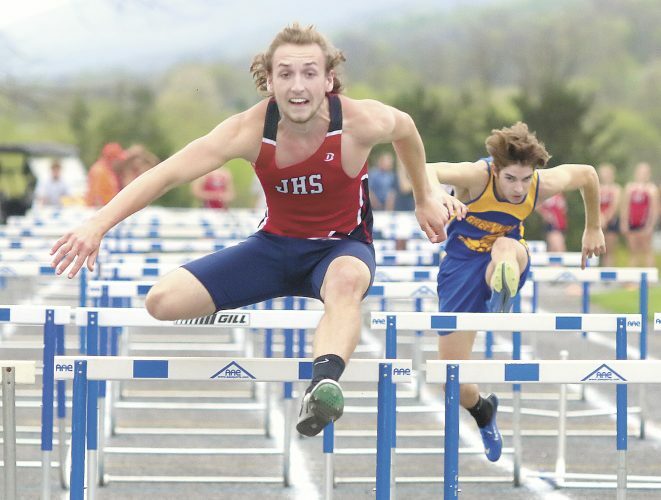 Neiswender, also without a stellar record but a senior who saw a good bit of mat time, probably was expecting Shoemaker, who played a huge role in the Huskies’ advancement to the state field. Snook filled the role both ways. After surrendering two takedowns and a post-reversal escape to Neiswender, Snook turned him for perhaps the biggest pin of the season — certainly the biggest of his career — and a 24-3 Mifflin County lead. The teams traded pins in the next two bouts, both lasting to the third period. Brett Breider was a winner over Husky Anson Wagner; Trey Kibe dominated Brock Babb, collecting nearly a quarter of the Huskies’ 15 takedowns before giving Babb a view of the Giant Center scoreboard from below. At 30-9, it was far from over. Babb’s appearance allowed Boyertown to have its better wrestlers take on opponents the Bears thought they could beat in higher weights — and they did. Evan Mortimer (22-6 junior), Alan Alexander (22-10 freshman) and sophomore Jimmy Sinclair brought the Bears within 12 on the scoreboard with decisions at 170, 182 and 195, respectively. When Jacob Miller pinned Husky Aaron Henry at 220, the District 1 team was within six points of a tied, and would have advanced on criteria had it ended that way. Mifflin County, meanwhile, needed to win both of the remaining matches, or get one win with bonus points. It did. 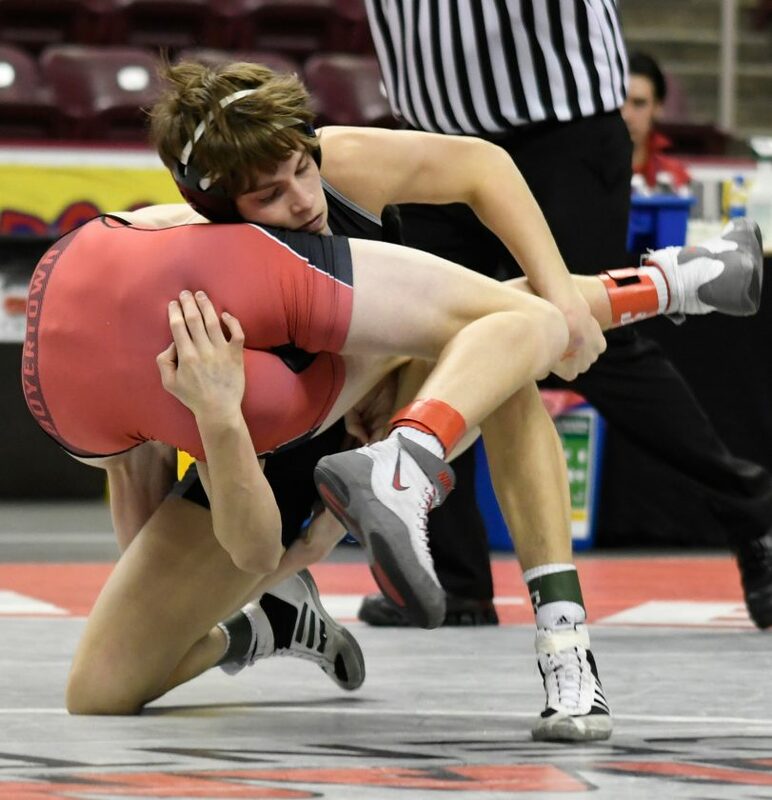 Blaine Davis pounded Boyertown’s Robert Terra into the mat at heavyweight, and 106-pounder Nic Allison staged a stunning third-period comeback against 28-8 sophomore Julien Maldonado to make the final, a win that, for now, will help define the program. In the nightcap, the District 10 powerhouse won eight of the 14 bouts, and allowed bonus points to the Huskies just twice. Kauffman (132 pounds) and Everly (138) won decisions that gave Mifflin County its only lead of the night, 6-3. Kibe had a pin at 160 and Brycen Hassinger a decision at 170 that tied the team score, but Cathedral Prep pulled away with its powerful upper weights. Mifflin County won two of the last three as Allison avenged a PJW loss from the past with a victory over Jacob Van Dee and Fisher pinned Elijah Hunt in the final bout. 113: Kade Davidheiser, B, DEC Cade Rishel 3-0. 120: Christian Fisher, MC, DEC Chance Babb 7-4. 126: Derek Burk, MC, DEC Dominic Sheridan 7-2. 132: Ethan Kauffman, MC, F Nicholas Montanye 1:58. 138: Kyler Everly, MC, F Noah Fisher 1:39. 145: Josh Snook, MC, F Connor Neiswender 2:33. 152: Brett Breidor, B, F Anson Wagner 4:25. 160: Trey Kibe, MC, F Brock Babb 4:13. 170: Evan Mortimer, B, DEC Brycen Hassinger 3-2. 182: Alan Alexander, B DEC Jacob Krepps 8-3. 195: Jimmy Sinclair, B, DEC Dylan Grassmyer 3-1. 220: Jacob Miller, B, F Aaron Henry 2:01. 285: Blaine Davis, MC, F Robert Terra 2:10. 106: Nicholas Allison, MC, DEC Julien Maldonado 9-8. 126: Ben Tirpak, ECP, DEC Derek Burk 4-3. 132: Ethan Kauffman, MC, DEC Alex Chelton 9-4. 138: Kyler Everly, MC, DEC Caden Farr, 4-2. 145: Paniro Johnson, ECP, F Josh Snook 2:33. 152: Marques McClorin, ECP, F Anson Wagner 2:00. 160: Trey Kibe, MC, F Hunter Sunafrank 1:45. 170: Brycen Hassinger, MC, DEC Kelsyn Blossey 3-0. 182: Carter Starocci, ECP, F Jacob Krepps 1:55. 195: Kareem Carson, ECP, DEC Dylan Grassmyer 7-3. 220: Dorian Crosby, ECP, forfeit. 285: Kawaun Deboe, ECP, F Blaine Davis 1:54. 106: Nic Allison, MC, DEC Jacob Van Dee 7-6. 113: Kaemen Smith, ECP, F Cade Rishel 1:47. 120: Christian Fisher, MC, F Elijah Hunt 2:15.